For fans of Christopher Guest’s delightful mockumentary Best in Show, about a Westminster-like dog show, I have some excellent news. 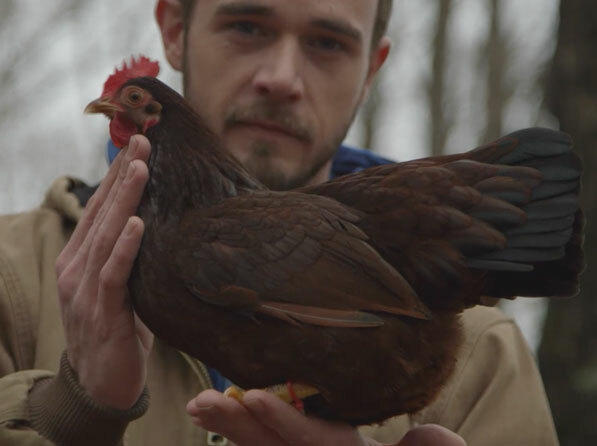 There’s a new film in town, Chicken People, and this one offers up an even more ridiculous spectacle: a show-chicken competition. That’s right. It’s a profile of people who breed and show a wide variety of chicken breeds, all for the glory of seeing one of their animals win the title of “Super Grand Champion,” as determined by a panel of judges who consult the American Standard of Perfection (for chickens). The best part of the movie is that, unlike Guest’s story, this is a documentary, not a mockumentary. What unfolds on the screen is not just reel truth, but real truth, as well. Filmmaker Nicole Lucas Haimes (Cracking the Code) follows three main characters, each of whom is obsessed, in his or her own way, with winning it all. Brian Caraker is a singer (primarily of jazz and 1960s standards) whose job keeps him away from his chickens more often than he’d like, forcing his parents to look after them for him, though he is the one with the passion. Brian Knox is a race-engine designer who applies the same scientific principles to his breeding program as he does to his engines. Shari McCullough is a self-described homemaker who devotes almost of her free time and energy to a vast menagerie of animals, with special emphasis on her chickens. Along the way, we meet other incidental characters who liven up the background with their own stories of breeding and competition. It’s all terrific fun, since there’s nothing more entertaining than seeing others take seriously something that the rest of us view as comical. We also learn an extensive amount of detail about chickens. Did you know that there are 154 recognized breeds? Did you know that there are over 230 show competitions in the country? The big one, annually, is the Ohio National, where, in 2014, over 9700 birds competed for the top prizes. And how do the chickens feel about all of this? Well, many of them seem well-loved, though at one point we discover that the ones who don’t produce winning strains are eaten by some of their breeders (while others abstain from chicken products altogether). I’m not sure how to read a chicken’s mood, to be honest. But certainly these ones are better groomed than your average farm poultry (and we are treated to shot after gorgeous shot of their marvelous plumage). So there’s that. Haimes cuts the whole together with peppy music and zippy graphics, and keeps the narrative moving along at a brisk pace. We get to know our protagonist trio well enough so that we care about how their particular lives will play out post-competition. The world of show chickens may be absurd (to me), but these good people are genuine enough. We all have our obsessions, for sure. The crazier, the better, as far as cinema goes.